One Loaf of 50 % Whole Wheat Bread with Cracked Wheat Kernels! Now let's go make a loaf of this delightful, light whole wheat bread with cracked wheat kernels! Add 1/3 cup cracked wheat and fully mix in. Add 1 cup of whole wheat flour and beat 100 strong strokes with a wooden spoon. Add 1/2 cup whole wheat flour and 1/2 cup white flour and mix in fully. cover the loaf with a piece of parchment paper (or wax paper although it sticks a little more) and let rise in a warm, draft-free place for 45 minutes or until double in bulk. Q: What is it you like, so much, about this cracked wheat recipe? A: Well, where do we start? Let's see. It's easy ... it's so darned easy to make, it's almost embarrassing. Instead of a few small, pre-soaked kernels so softened you can't identify them; or hard, little, crunchy bits on the outside, this loaf has chewy pieces of wheat kernels spread throughout the dough contributing significantly to the texture of this loaf. This is not sprinkled with a few of those over-softened or over-crispy, slightly larger than sand-sized pieces of grain strewn about a white bread. These are nicely textured (chewy) pieces of wheat on a wholesome tasting, healthy, 50 % whole wheat loaf. This recipe is easy to modify. Start with as little as 1/2 cup of whole wheat flour and finish with white or make a 100 % whole wheat loaf. This bread is a good source of dietary fiber. It would not be a misnomer to call this a "cracked wheat bread" except that with almost all other cracked wheat breads, they are based on white bread with a little bit of over-softened cracked wheat added in (or over-crispy bits added to the outside). This is 50 % whole wheat bread with a full 1/3 cup of cracked wheat added in. 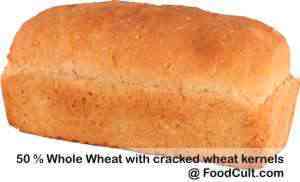 It would also be correct to call this a light (well, maybe medium at 50 %) whole wheat bread except that cracked wheat kernels in (even) a light whole wheat (at around 25 %) is rather uncommon. This loaf is a dietary fiber winner! Mostly oil free, this loaf is a bit more than a pound (around 500 g) has only one teaspoon of salt and and 1 1/2 teaspoons of sugar. While you may elect to make small adjustments based on taste, this vegan loaf is an excellent, all purpose, light whole wheat bread ... with cracked wheat.